I don’t know when and how municipality and local elections became so politically important for the European states even though this reality became more obvious in mid-eighties. Suddenly small towns became important for the parties, unfortunately only once every four years, and candidates that have very rarely put o foot in those towns, became the chosen ones to rule them. Things became tenser in the capital cities, where the candidates were not only the chosen ones for the locals but they were also one step before the leadership of the party and the prime minster’s seat. Furthermore, local and municipality elections have become a barometer to measure the parties’ influence before or after general elections. Days after the first round and days before the final second round of the French municipality elections, the populist, anti-immigration and euro-sceptic National Front talks about a triumph, while the governing socialist party of the president Hollande talks about a political disaster. These elections were a great test for the National Front to prove that veiling racist, prejudice, hate and violence believes and practices under the political correct veil of the euro-sceptic can actually make voters to trust them. A practice unfortunately used successfully before by Hitler in mid-thirties when he covered the crimes that were coming with the veil of the then popular in Germany, anti-Versailles rhetoric. But this is the stupidity of the people who never learn from their mistakes. Actually it was a Greek politician who said a few years ago that the masses' historic memory is limited to ten years maximum. However this might be an issue for another article, the point here is that locality doesn’t exist in the local elections. And even when the candidate is locally known, is chosen to serve party’s agendas and personal plans and not the local interests. And that since occasionally local interests are in conflict with the party’s agendas especially when the party happens to govern. Of course Greece could not be an exception to all that, especially in the years of austerity where the political spectrum has been divided not ideologically, but from their support or their opposition to the measures enforced by the troika. So you get candidates who actually base their whole campaign in an anti-austerity measures rhetoric and others who try to verify the ruling parties' stand to apply the austerity measures. Nevertheless in between their party’s agendas and their personal political plans you get some local promises as well, fulfilling all the naive stereotypes for the ones who govern municipalities. Promises like green parks, better squares, clean streets, light in the every corner, all that ignoring the fact that these "promises" are part of their job description and the citizens have real expectations form their representatives in the local councils. Especially during the recession where hospitals and schools are seriously wounded and in dispirit need for help. Athens has the full collection of party servants and lackeys. Some of them even ignorant to the basic problems the Greek capital is facing, limiting their promises to new lamps and special parks for pets. Sadly some of them represent the mainstream and ruling political parties and actually have dreams and agendas in the Greek political arena that go as high as presidential seats. Naivety is not an excuse for them, since most of them are experience politicians who have served in the parliament with some of them still serving. Stupidity cannot be an excuse either, since everything seems well calculated and manipulated based in people’s fears. And talking about people’s fears, of course the neo-Nazi Golden Dawn is participating in those elections. First test after the arrests and imprisonment of their leader and the accusations of a criminal organization. But even though the well publicized crimes and the real identity of the neo-Nazi driven party, there are still people intoxicated from the populism and fake anti-establishment rhetoric that are going to vote for them proving that stupidity has absolutely no limits. What remains is to find a candidate who really cares about the Athenians and the city of Athens per se, without political agendas and personal plans. Surprisingly and unexpectedly this candidate is coming from a sports team, flagging the ideals of a sports team, having as a mark the logo of a sports team and the support of a sport team’s fans. 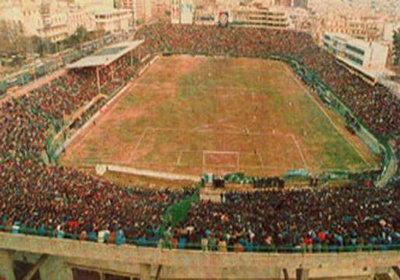 The motivation behind this candidacy is the attitude of the state to neglect the citizens’ needs even if these needs cover plain sports and most importantly the corruption of mayors and candidates who readily sacrifice a football stadium (the fans’ team home) to the interests for profit of mega constructors with mega financial interests in the area, who are planning to turn the stadium into mega malls. Mr. Nicos Avramidis, the candidate mayor, has no hopes for a mayor-ship, acknowledging the strangling situation the other candidates have created, and the only thing he wants is a dignify presence in the Athens’ council so he can defend Panathinaikos stadium from the mega money-sharks and their servants in the town-hall. Sad? Amazing? Unbelievable? All the above together. Panathinaikos F.C. is part of the history of modern Athens for more than a century. A team that enpowered the Greek Olympic teams from their modern foundations with athletes to every sport. A name connected with the most glorious athletic moments of the city and the country. 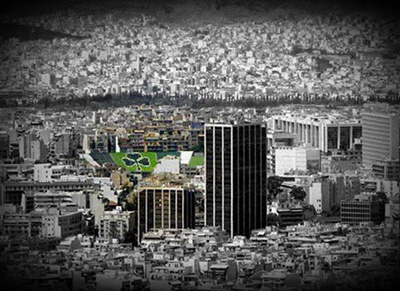 A team with hundreds thousands fans who feel Athenians with the winder sense of being an Athenian wherever they live. And these people have not just been ignored but they have also been neglected. Not only from the state and the authorities but also by the candidates who actually and hypocritically demand their vote. Furthermore they have baptised hooligans and troublemakers just because their wishes contradict the wishes of the candidates’ real mega bosses. This candidacy actually proves how little local the local elections count in thier locality; how dirty and corrupted the Greek political system has become and how urgent is for democracy to return to basics where the representative politicians are and feel servants of the people and they are there to serve the people’s needs even if these needs cover just a football stadium. But for that the people must act and not expect from one Avramidis and a group of football fans – doesn’t matter how big or small - to do the difference.